At Paris Roubaix Silvan Dillier of AG2R La Mondiale enjoyed (or should that be suffered?) a hugely impressive ride. He entered the velodrome first after spending over 200km on the attack, matching Peter Sagan pedal stroke for stroke but just lost out to the triple world champion in the final stages of the sprint. Silvan has been using the CeramicSpeed OSPW system all season, and said the OSPW System worked extremely well on the cobblestones. "I didn’t have a single shifting problem nor any other interruptions that could arise from the demanding pavé," he said. "I would recommend it to all the stylers out there who want to be both different and benefit from valuable marginal gains." While personalised pulley wheels might be a step too far for most of us, this is how Silvan Dillier rolls. Image: CeramicSpeed. 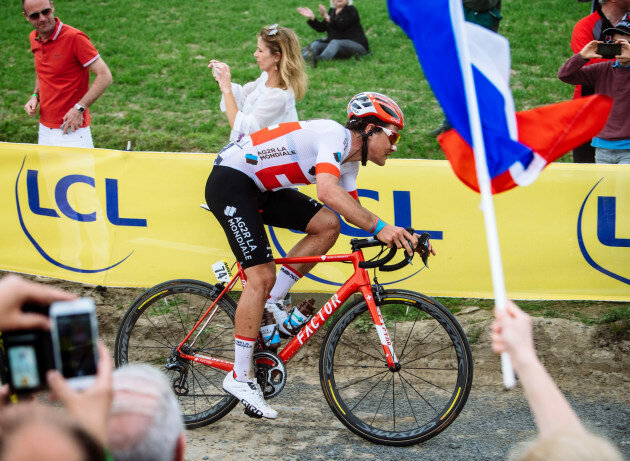 Silvan Dillier in action at the 2018 Paris Roubaix. Image: CeramicSpeed. Since their international launch in 2004 CeramicSpeed have been working to provide the very best equipment, the lowest levels of friction and therefore valuable marginal gains. 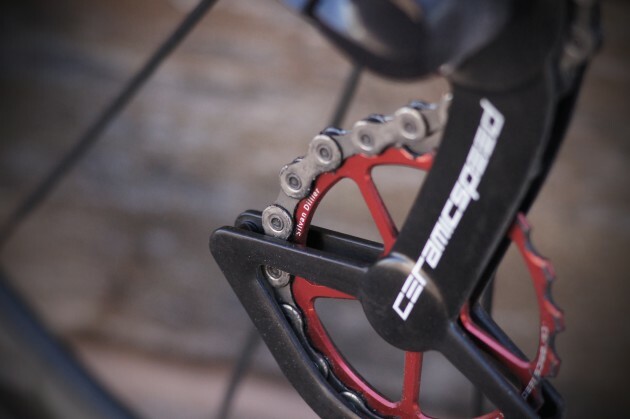 Now with a number of pro teams using CeramicSpeed’s Oversized Pulley Wheels (OSPW), the company say this system provides the most efficient drivetrain performance on the market. The OSPW System is said to optimize the overall efficiency of the drivetrain, thanks to the extremely low friction of the CeramicSpeed Bearings and the unique design of the overall system. Teams have also turned to CeramicSpeed’s UFO Drip Chain Coating, perfect for the gritty Spring Classics. Proven as the world's fastest bottled product for chains, it is applied as a liquid which then hardens into a completely dry coating - giving the riders up to 200km of smooth riding regardless of weather. The oversized system in place during this year's Strade Bianche. Another achievement of the season so far came from Romain Bardet of AG2R La Mondiale with an aggressive and very well deserved second place, after an epic ride at this year’s Strade Bianche. He dominated the steep gravel road climbs of southern Tuscany and went on the attack in heavy rain and mud; a lead which he held until 15 km to go. "I'm delighted to use CeramicSpeed," said Bardet. "They are the best on the market in terms of drivetrain efficiency. With the OSPW System I can be sure that I'm not wasting any watts while pedalling. In cycling, every single watt counts. Being able to save some to ride faster for longer can make all the difference in the end."